This is a quickstart guide for getting AsterixDB running in a distributed environment. This guide also introduces the AsterixDB installer (nicknamed Managix) and describes how it can be used to create and manage an AsterixDB instance. By following the simple steps described in this guide, you will get a running instance of AsterixDB. You shall be able to use AsterixDB from its Web interface and manage its lifecycle using Managix. This document assumes that you are running some version of Linux or MacOS X. If your version is at least 1.8.0_x, similar to the output shown below, you are good to proceed. Linux would be at a path under /usr/lib/jvm/[jdk-version]. We assume a user called “Joe” with a home directory as /home/joe. On a Mac, the home directory for user Joe would be /Users/joe. If you do not see any output, JAVA_HOME is not defined. We need to add the following line to your profile located at /home/joe/.bash_profile or /home/joe/.bashrc, whichever you are using. If you do not have any of these files, create a ~/.bash_profile file. If SSH is not enabled on your system, please follow the instruction below to enable/install it or else skip to the section Configuring Password-less SSH. The Apple Mac OS X operating system has SSH installed by default but the SSH daemon is not enabled. This means you can’t login remotely or do remote copies until you enable it. To enable it, go to ‘System Preferences’. Under ‘Internet & Networking’ there is a ‘Sharing’ icon. Run that. In the list that appears, check the ‘Remote Login’ option. Also check the “All users” radio button for “Allow access for”. This starts the SSH daemon immediately and you can remotely login using your username. The ‘Sharing’ window shows at the bottom the name and IP address to use. You can also find this out using ‘whoami’ and ‘ifconfig’ from the Terminal application. Assumming that you have enabled SSH on your system, let us proceed. If you get an output similar to one shown below, type “yes” and press enter. RSA key fingerprint is aa:7b:51:90:74:39:c4:f6:28:a2:9d:47:c2:8d:33:31. If you are not prompted for a password, that is if you get an output similar to one shown below, it signifies that you already have password-less SSH configured. Skip to the next section Configuring Managix. You are here because you were prompted for a password. You need to configure password-less SSH. We shall generate a (public,private) key-pair as id_rsa.pub and id_rsa respectively. If $HOME/.ssh already contains a (public,private) key-pair, please ensure the files are renamed before proceeding. Follow the instructions below. If a key already exists, you should get an output similar to what is shown below. Press ‘y’ to overwrite the existing key. It is required to use the default name. If you wish to not overwrite a pre-existing key, ensure that the pre-existing key is saved with a different name. We shall now retry SSH without password. You should now be able to log in without being prompted for a password or a response. Execute ‘exit’ to close the session. You will need the AsterixDB installer (a.k.a. Managix). Download the Standalone Cluster installer from here; this includes the bits for Managix as well as AsterixDB. We will refer to the directory containing the extracted files as MANAGIX_HOME and we assume that MANAGIX_HOME/bin is on your PATH. conf/managix-conf.xml: A configuration XML file that contains configuration settings for Managix. A configuration XML file that describes the nodes in the cluster, e.g., clusters/local/local.xml. Let us do a sample run to validate the set of configuration files auto-generated by Managix. indicating its availability for executing statements/queries. -n Name of the AsterixDB instance. We shall now use the create command to create an AsterixDB instance by the name “my_asterix”. In doing so, we shall use the cluster configuration file that was auto-generated by Managix. The third line above shows the web-url http://127.0.0.1:19001 for an AsterixDB’s web interface. The AsterixDB instance is in the ‘ACTIVE’ state, indicating that you may access the web interface by navigating to the web url. Press the “Run” button. If the query result shows on the output box, then Congratulations! You have successfully created an AsterixDB instance! We assume that you have successfully completed the single-machine AsterixDB installation by following the instructions above in section AsterixDB installation. In this section, we shall cover advanced topics related to AsterixDB configuration. Before we proceed, it is imperative to go through some preliminary concepts related to AsterixDB runtime. An AsterixDB runtime comprises of a ‘‘master node’’ and a set of ‘‘worker nodes’’, each identified by a unique id. The master node runs a ‘‘Cluster Controller’’ service (a.k.a. ‘‘CC’’), while each worker node runs a ‘‘Node Controller’’ service (a.k.a. ‘‘NC’’). Please note that a node in an AsterixDB cluster is a logical concept in the sense that multiple nodes may map to a single physical machine, which is the case for a single-machine AsterixDB installation. This association or mapping between an AsterixDB node and a physical machine is captured in a cluster configuration XML file. In addition, the XML file contains properties and parameters associated with each node. We shall next explain the components of the cluster configuration XML file. The single-machine AsterixDB instance configuration that is auto-generated by Managix (using the configure command) involves a master node (CC) and a worker node (NC). Each node is assigned a unique id and provided with an ip address (called ‘‘cluster_ip’’) that maps a node to a physical machine. The following snippet from the above XML file captures the master/worker nodes in our AsterixDB installation. The following is a description of the different elements in the cluster configuration xml file. id A unique id for a node. cluster_ip IP address of the machine to which a node maps to. This address is used for all internal communication between the nodes. client_ip Provided for the master node. This IP should be reachable from clients that want to connect with AsterixDB via its web interface. client_port Provided for the master node. This is the port at which the Cluster Controller (CC) service listens for connections from clients. cluster_port Provided for the master node. This is the port used by the Cluster Controller (CC) service to listen for connections from Node Controllers (NCs). http-port Provided for the master node. This is the http port used by the Cluster Controller (CC) service. The following is a list of properties associated with each worker node in an AsterixDB configuration. java_home Java installation directory at each node. log_dir A directory where the worker node JVM may write logs. txn_log_dir A directory where the worker node writes transaction logs. iodevices Comma separated list of IO Device mount points. store A data directory (under each iodevice) that AsterixDB uses to store data belonging to dataset(s). All the above properties can be defined at the global level or a local level. In the former case, these properties apply to all the nodes in an AsterixDB configuration. In the latter case, these properties apply only to the node(s) under which they are defined. A property defined at the local level overrides the definition at the global level. Next we explain the following setting in the file $MANAGIX_HOME/clusters/local/local.xml. Managix associates a working directory with an AsterixDB instance and uses this directory for transferring binaries to each node. If there is a directory that is readable by each node, Managix can use it to place binaries that can be accessed and used by all the nodes in the AsterixDB set up. A network file system (NFS) provides such a functionality for a cluster of physical machines so that a path on NFS is accessible from each machine in the cluster. In the single-machine set up described above, all nodes correspond to a single physical machine. Each path on the local file system is accessible to all the nodes in the AsterixDB setup and the boolean value for NFS above is thus set to true. It is possible to have a single host for Zookeeper. A larger number of hosts would use Zookeeper’s replication and fault-tolerance feature such that a failure of a host running Zookeeper would not result in loss of information about existing AsterixDB instances. Notice that each machine has a ‘‘cluster_ip’’ address, which is used by these machines for their intra-cluster communication. Meanwhile, the master machine also has a ‘‘client_ip’’ address, using which an end-user outside the cluster can communicate with this machine. The reason we differentiate between these two types of IP addresses is that we can have a cluster of machines using a private network. In this case they have internal ip addresses that cannot be used outside the network. 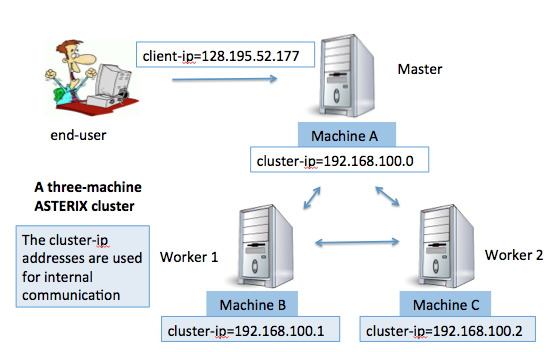 In the case all the machines are on a public network, the “client_ip” and “cluster_ip” of the master machine can share the same address. Next we describe how to set up AsterixDB in this cluster, assuming no Managix has been installed on these machines. The steps of setting up SSH are similar to those in the single-machine setup case. We assume we have a common user account called “joe” on each machine in the cluster. machineA> ssh-keygen -t rsa -P ""
Note that it is recommended that MANAGIX_HOME is not located on a network file system (NFS). Managix creates artifacts/logs that are not required to be shared. Any overhead associated with creating artifacts/logs on the NFS should be avoided. <!-- Directory for Asterix to store worker logs information for each machine. Needs to be on the local file system of each machine. Managix creates the directory if it doesn't exist. <!-- Directory for Asterix to store transaction log information for each machine. As stated before, each of the above properties can be defined at the cluster level, in which case it applies to all the nodes in the system. Each property can also be defined at a node level. The authenticity of host '192.168.100.1 (192.168.100.1)' can't be established. RSA key fingerprint is 89:80:31:1f:be:51:16:d7:2b:f5:e0:b3:2c:bd:83:94.
and this output may be repeated for each node in the cluster. Answer “yes” each time. it means that the XML configuration file is correct! We use the validate command to validate the Managix configuration. To do so, execute the following. Note that the configure command also generates a cluster configuration XML file at $MANAGIX_HOME/clusters/local/local.xml. This file is not needed in the case of a cluster of machines. We shall now use the create command to create an AsterixDB instance called “rainbow_asterix”. In doing so, we shall use the cluster configuration file that was auto-generated by Managix. If the response message does not have warning, then Congratulations! You have successfully installed AsterixDB on this cluster of machines! Please refer to the section Managing the Lifecycle of an AsterixDB Instance for a detailed description on the set of available commands/operations that let you manage the lifecycle of an AsterixDB instance. Note that the output of the commands varies with the cluster definition and may not apply to the cluster specification you built above. create Creates a new asterix instance. describe Describes an existing asterix instance. stop Stops an asterix instance that is in the ACTIVE state. start Starts an AsterixDB instance. backup Creates a backup for an existing AsterixDB instance. restore Restores an AsterixDB instance. delete Deletes an AsterixDB instance. validate Validates the installer/cluster configuration. configure Auto generates a configuration for an AsterixDB instance. log Produces a zip archive containing log files from each node in an AsterixDB instance. shutdown Shuts down the installer service. We already talked about create and validate commands. We shall next explain the rest of the commands listed above. We also provide sample output messages of these commands assuming we are running an AsterixDB instance on a single machine. Provides information about an AsterixDB instance. [-n]      Name of the AsterixDB instance. The brackets indicate optional flags. The output of the describe command when used without the admin flag contains minimal information and is similar to the output of the create command. Let us try running the describe command in “admin” mode. As seen above, the instance ‘my_asterix’ is configured such that all processes running at the localhost (127.0.0.1). The process id for each process (JVM) is shown next to it. The stop command can be used for shutting down an AsterixDB instance. After that, the instance is unavailable for executing queries. The usage can be looked up by executing the following. to the INACTIVE state, indicating that it is no longer available for executing queries. To stop the AsterixDB instance. Starts an AsterixDB instance that is in INACTIVE state. After executing the start command, the AsterixDB instance transits to the ACTIVE state, indicating that it is now available for executing statements/queries. Let us now start the AsterixDB instance. The backup command allows you to take a backup of the data stored with an AsterixDB instance. The backup can be taken on the local file system or on an HDFS instance. In either case, the snapshots are stored under a backup directory. You need to make sure the backup directory has appropriate read/write permissions. Configuring settings for backup can be found inside the Managix’s configuration file located at $MANAGIX_HOME/conf/managix-conf.xml. We need to provide a path to a backup directory on the local file system. The backup directory can be configured be editing the Managix configuration XML, found at $MANAGIX_HOME/conf/managix-conf.xml. To configure a backup to be taken on an HDFS instance, we need to provide required information about the running HDFS instance. This information includes the HDFS version and the HDFS url. Simply edit the Managix configuration file and provide the required information. The above output shows the available backup identified by it’s id (0). We shall next describe the method for restoring an AsterixDB instance from a backup snapshot. Restores an AsterixDB instance's data from a previously taken backup. The following command restores our AsterixDB instance from the backup snapshot identified by the id (0). Prior to restoring an instance from a backup, it is required that the instance is in the INACTIVE state. You can start the AsterixDB instance by using the start command. The log command allows you to collect the log files coresponding to each node of an AsterixDB instance into a zip archive. The zip archive is produced on the local file system of the machine running managix. -d destination directory for producing the zip archive. Defaults to $MANAGIX_HOME/logdump. The following is an example showing the use of the log command. Permanently deletes an AsterixDB instance. The instance must be in the INACTIVE state. INFO: AsterixDB instance my_asterix deleted. Managix uses Zookeeper service for storing all information about created AsterixDB instances. The Zookeeper service runs in the background and can be shut down using the shutdown command. The help command provides a usage description of a Managix command. configuration settings for a single node setup. What happens if a machine acting as a node in the Asterix cluster becomes unreachable for some reason (network partition/machine failure) ? When a node leaves the Asterix cluster, the AsterixDB instance transits to an ‘UNUSABLE’ state, indicating that it is no longer available for serving queries. To know which set of node(s) left the cluster, run the describe command with -admin flag. Above command will show the state of AsterixDB instance and list the set of nodes that have left the cluster. The failed node must be brought back to re-join the cluster. Once done, you may bring back the instance to an ‘ACTIVE’ state by executing the following sequence. The processes associated with the instance are terminated and the instance moves to the INACTIVE state. 2) Start the AsterixDB instance using the start command. Do I need to create all the directories/paths I put into the cluster configuration XML ? Managix will create a path if it is not existing. It does so using the user account mentioned in the cluster configuration xml. Please ensure that the user account has appropriate permissions for creating the missing paths. Should MANAGIX_HOME be on the network file system (NFS) ? It is recommended that MANAGIX_HOME is not on the NFS. Managix produces artifacts/logs on disk which are not required to be shared. As such an overhead in creating the artifacts/logs on the NFS should be avoided. How do we change the underlying code (apply a code patch) for an ‘active’ asterix instance? Assume that you have an ‘active’ instance by the name a1 that is running version v1 of asterix. You have a revised version of asterix - v2 that fixes some bug(s). a1 now is running on version v2. a) Obviously this wont work in a situation where v2 has made a change that is incompatible with earlier version, such altering schema. b) A change in asterix zip applies to all existing instances (after a restart) and subsequent instances that user creates.